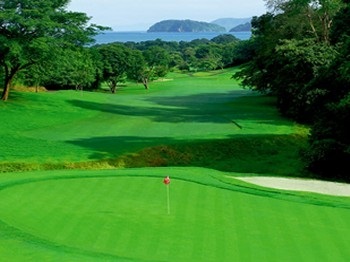 When was the last time you read any golf travel related news from Costa Rica? Time was you couldn’t turn your computer on without somehow increasing your already impressive knowledge of the country’s golf scene. Most people familiar with the golf publishing business are aware that much of the golf travel news they read is generated by PR agencies who really don't miss a trick when it comes to spreading the gospel. If companies representing the Las Vegas, Kerry, Queensland or Puerto Rico visitors bureaux are given the green light to promote golf facilities located in those areas, then guess what you'll be reading about. Anyway, it seems the Costa Rica golf PR engine has been filled with sand for a few years now, so noticeably quiet has it become. So what happened? I was part of a CRGA trip about six years ago since when only nine new holes have appeared – at the San Buenas Golf Resort 200 miles south of the capital San José. Canadian architect Dan Lavis whose work appears predominantly in Ontario and who is also ‘Keeper of the Green’ at Tarandowah GC in Springfield, Ont., designed the holes that will one day be joined by nine more. Though highly-regarded, San Buenas’s nine holes are hardly enough to tempt you all the way to Central America – southern Central America to be precise. What courses were here before the global economy went sour certainly are though. Landy Blank has long maintained his adopted land probably isn’t a genuine golf destination with only six public-access 18-holers separated by some pretty arduous driving. But among that half-dozen are some absolute peaches. My favorite was Hacienda Pinilla, designed by Athens, Ga.-based Mike Young who built some lovely holes through a very low-density 4,500-acre property purchased and first developed in the early 1970s by Atlanta businessman H.G. Patillo. Last September, the company that manages the resort, Agroganadera Pinilla S.A., announced it would be auctioning off the property with a sale price expected to be close to $2b. Patillo’s plan is to use the money to fund two NGOs (involved in healthcare, education, and affordable housing) he established in the province of Guanacaste. Arnold Palmer’s course at the Four Seasons Resort on the Papagayo Peninsula is another wonderful round with a handful of holes you can’t take enough photographs of. Besides the memorable golf, the attractions here include capuchin monkeys who have now watched enough golfers putting to know exactly when to start screaming. Until recently Blank’s clients were not able to play the course unless they were staying at the resort, but the course has now been made available to them. “That makes for the perfect beach trip with golf and an overnight at the Hilton by the Liberia airport,” says Blank. The Costa Rica golf trip may be one of those you take when you’ve been everywhere else, but you’ll certainly be glad when you get there.